Driven by the sad loss to cancer earlier this year of their good friend and Rapierstar company accountant Jonathan Curwen, David and Scott trekked in unseasonably deep snow and blizzard conditions to a height of 4,000m close to the peak of Mount Toubkal, north Africa’s highest peak. They are 80% of the way towards their fundraising target which will provide support for Cancer Research UK and are still welcoming donations via www.justgiving.com/rapierstar – funds that they hope will help in the ongoing fight against cancer and prevent future suffering. David explains: “It was hard and slow going with crampons and ice axes required, but thankfully our Berber guide navigated us safely up to the top ridge at 4,000m and only 65% oxygen levels. Extreme weather conditions meant all the Berber guides denied access beyond the ridge, as it was simply too dangerous to attempt the very summit; with winds over 70mph, minus 27 degrees wind chill, almost no visibility and freezing snowfall. “Our return down was even more hazardous, regularly falling and sliding in the now waist deep snow. We were so relieved to see the refuge again! 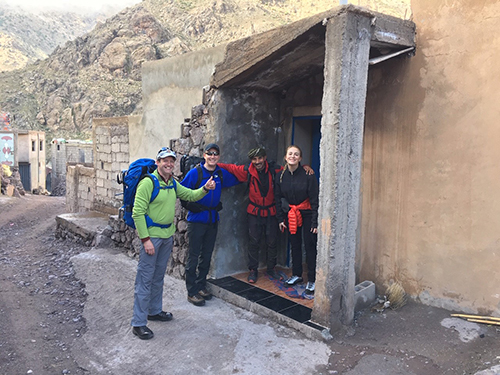 Once dry and re-charged, we descended slowly back to the village in deteriorating weather, thankful for our walking poles and with the pressure on to get back to the lodge in Imlil village before nightfall. Exhausted but elated, we all agreed that the experience was not to be forgotten.